...plus the purchase of a few other new items. So I have been perusing the Internet, Google Images being my favorite way to go, looking for some much needed inspiration. 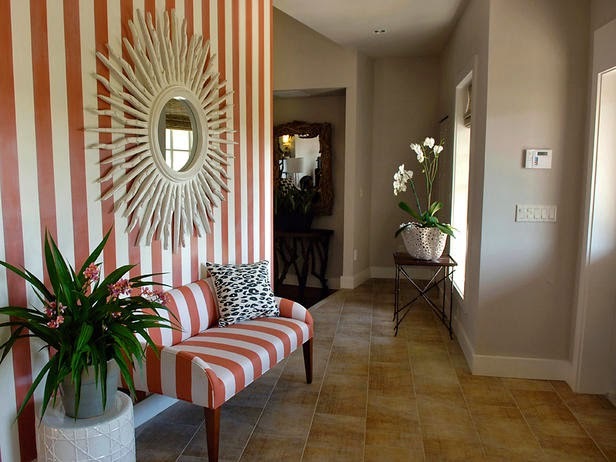 I had fun checking out the many beautiful foyer ideas, so I thought I'd share with you a few that really caught my eye. 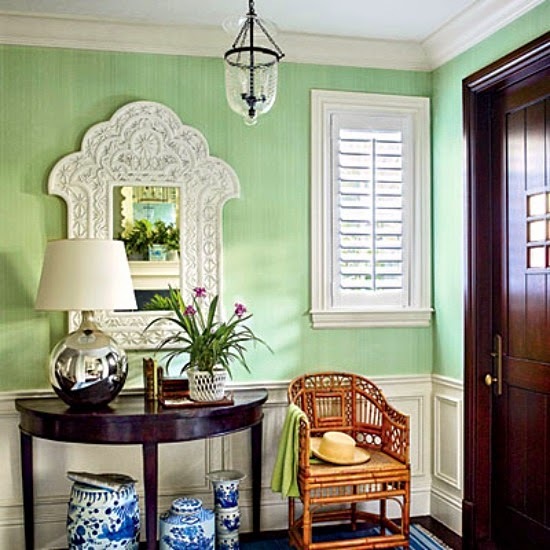 I just adore the cozy feel of this first pic from Southern Living. And I am really crushing on this wood and iron railing. Thinking that maybe just what is needed on our staircase. Isn't it pretty? This next entry is cozy as can be and wonderfully charming. 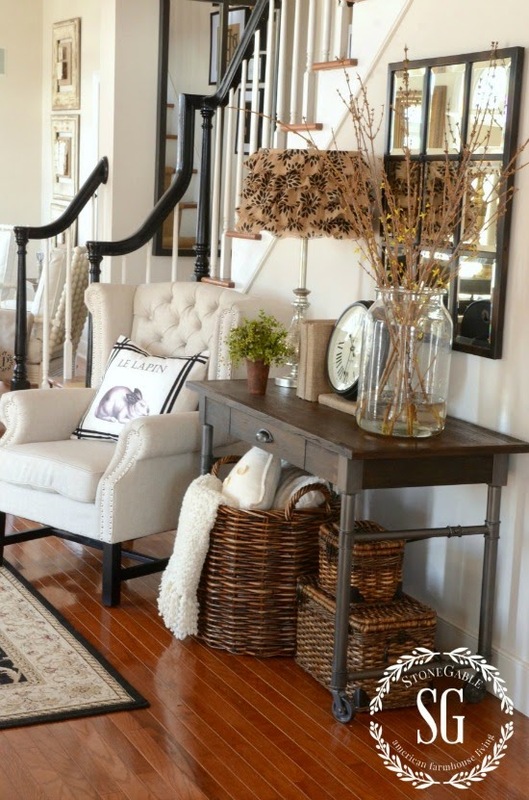 Vanessa from the blog At the Picket Fence, shows off her elegant foyer. She strikes the perfect balance between wall art and furnishings. You know the saying...Go Big or Go Home! This is not the entry to the home, excuse me, mansion, it is actually on the second floor, however it very well could be a foyer. This is the Blairsden Mansion, one of the largest privately owned homes in the country, located in Peapack-Gladstone NJ. I went on a tour of this magnificent place last May. If you would like to see the entire mansion tour just click here. This next foyer is my hands down favorite. I love the architectural detail of the walls, ceiling and doorway casings, which seems to render this space absolutely timeless! And who doesn't adore StoneGable farmhouse? Yvonne has the most amazing style and her entry is simply stunning! Don't you love her new chair? I'd want to park myself in that chair for hours just to sit and admire her lovely farmhouse inspired home. 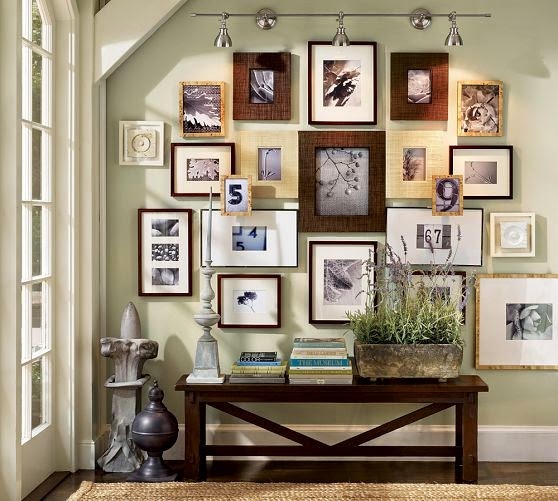 Here's another entry idea from Pottery Barn. 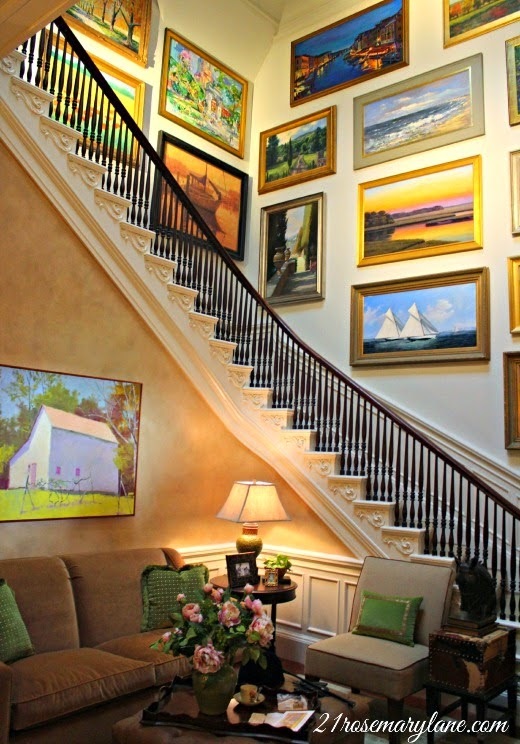 I've recently noticed that I am drawn to the idea and look of gallery walls. To me they tell a story. And finally this last entry, which is way way way out of my reach, I had to share because I think it is just beautiful! So there you have it! Some wonderful inspiration for me to mull over in my mind. I do have a few ideas of what I'd like to do in our foyer, I just need to play around with them over the next few days. But in the meantime, I am wishing you all a very happy last week of February! Oh My Word!!! These are all gorgeous. I love the first Pottery Barn pic and the one with the Harvest table and those stunning architectural details. Can't wait to see what you do. Beautiful inspiration Barbara! Can't wait to see what you come up with... I know it's going to beautiful! Barbara, there is so much inspiration in this post! 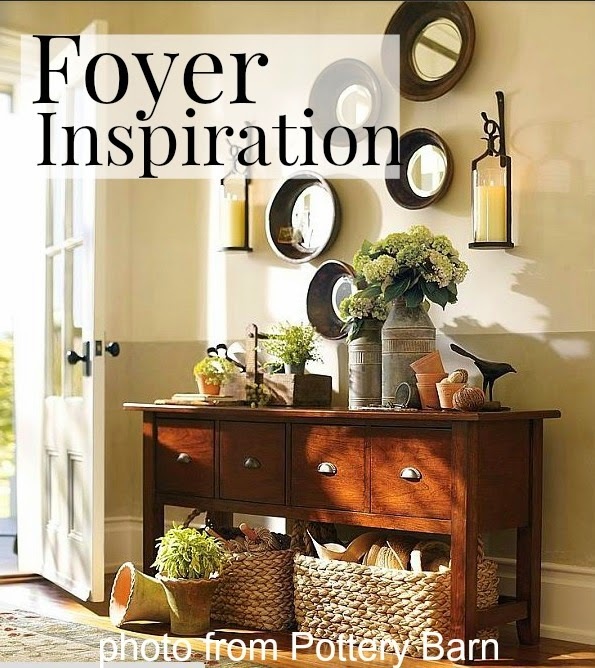 Love the Pottery Barn ideas; and of course, StoneGable is so dreamy! I am sure that whatever you decide to do will be beautiful! What fabulous ideas. I adore the dropleaf table. They are all stunning and I really like the last one. I would have a hard time picking one. Good luck with your choice and I am sure it will look fabulous. Beautiful ideas Barbara. 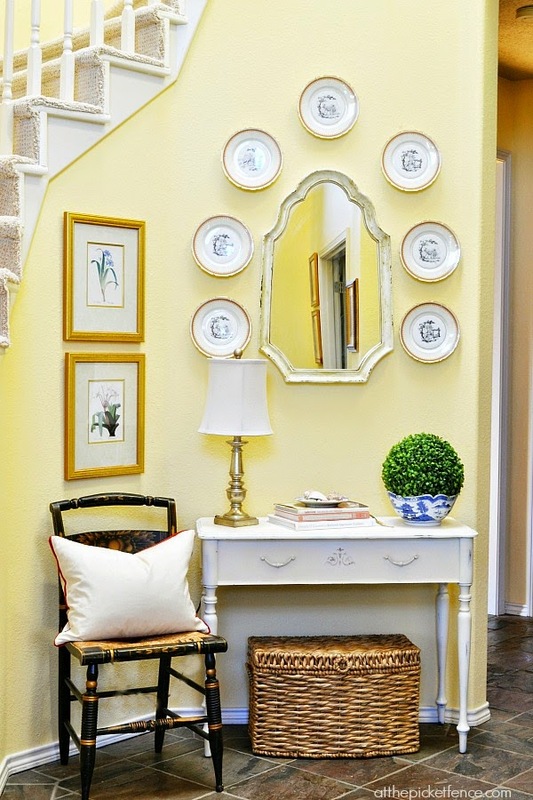 I love the foyer with the drop leaf table. So pretty. Have a great start to the new week ahead. Amazing inspiration all around! Can't wait to see what you do! I also love the gallery wall photo. What a lovely way to put it: they tell a story. I also like foyers large enough for the round table in the middle. I once visited a restored antebellum home in GA, which featured the wide central hall from front to back of the house. 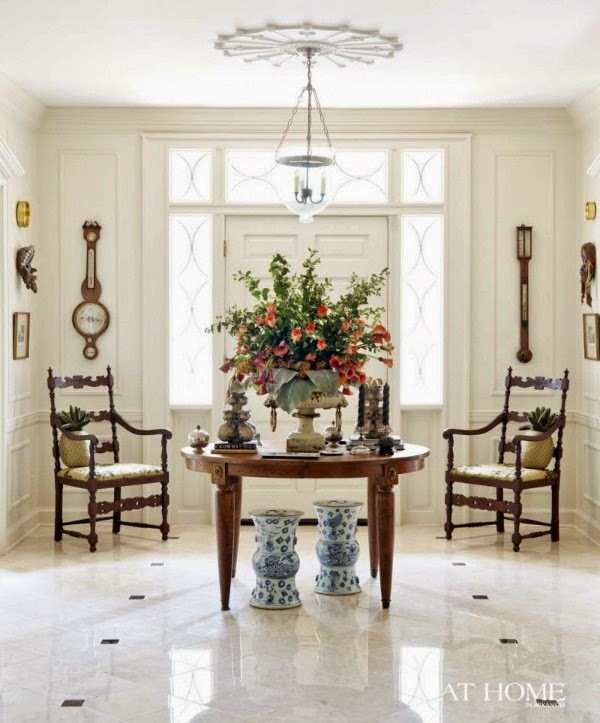 That entry area was sufficiently large to boast an antique dining table -- with the leaf removed it was round. Flowers, books, and some other decorative elements graced the tabletop. Gorgeous and memorable! I love them all, I can't imagine how you are going to chose! Whatever you do, I just know it will be amazing! All of them are absolutely beautiful, tasteful.